World War I Bridges - WW1 Centenary from the river Piave: First World War one day itineraries through Italy. Suggestion no. 14: the Brenta river valley and the "Sentiero del Vu"
First World War one day itineraries through Italy. Suggestion no. 14: the Brenta river valley and the "Sentiero del Vu"
The river Brenta runs from the lakes of Levico and Caldonazzo, near Trento, to the Adriatic sea. Before reaching the Venetian plain and the city of Bassano with its renowned wooden Old Bridge (also called Ponte degli Alpini because the General Cadorna and the Italian Army crossed it to reach the Asiago plateau during WWI), this river flows in its first section through a narrow gorge surrounded by high mountain ranges. And just before Bassano it is surrounded by the Grappa on its left side and exactly by the Asiago plateau on the right one. If you drive today on the provincial road, you will probably think this is a quite inhospitable region: the small villages along the Brenta river valley climb on the one hand the mountain slopes with effort, trying to steal few meters of cultivable plots of land; on the other hand they slip to the bank of the Brenta river, which represented in the past the fastest commercial and transport connection for the local inhabitants. Now, try to imagine these villages during the years of the Great War, as they were suddenly transformed in a crucial passage to and from the front-line. To introduce you to the history of the World War I in this Italian region we would like today to suggest an itinerary near Valstagna, a small village on the right bank of the Brenta river, about 15 Km northern from Bassano. As Italy entered the conflict, all houses of the village were occupied by troops coming from or going to the front line on the Asiago plateau. Civil population was forced to work at the construction of roads, water cisterns and other infrastructures for war necessities, before being completely evacuated in 1917. Since it represented for the Austro-Hungarian Army one of the entrance point to the Venetian plain, the whole valley and especially Valstagna became a strategic point, it is therefore not surprising to find even today a lots of signs of the events of those years. At the back of the village a web of mule tracks and paths climbs the steep side of the mountain, on whose top is the Asiago plateau. Part of these trails used during the WWI date back to the early modern age, when the tobacco plantation was the main economic resource for the valley inhabitants who connected with small paths the tiny terraced fields they had dug on the rocky slope of the mountain. This paths are today at the center of a touristic project called “Alta via del Tabacco” (further information, unfortunately only in Italian, here) and were recently equipped with new information panels. Among them one can find also some Great War itineraries, and we’d like today to suggest you the “Sentiero del Vu”. The path takes the name from Albino Celi, also called el Vu (the “You”), since he addressed everybody with the formal form of Vu, Voi (i.e. You). He was born in Valstagna at the end of the XIX century and he gained his life selling war wrecks (metals or gun powder) that he collected on the Asiago plateau or on the Ortigara. He died in 1963, becoming an example of the deep connection between the inhabitants of the Brenta river valley, the mountains and the War. Albino Celi was in fact recalled also in the work of the Italian author Rigoni Stern (Le stagioni di Giacomo - Giacomo's seasons, 1995) and in a docu-film by Ermanno Olmi on the Recuperanti, (literally "the rescuers" or "the collectors"), i.e. the poor inhabitants of the region that after the WWII collected and sold as Albino el Vu the war wastes scattered in the near mountains during both the world conflicts . 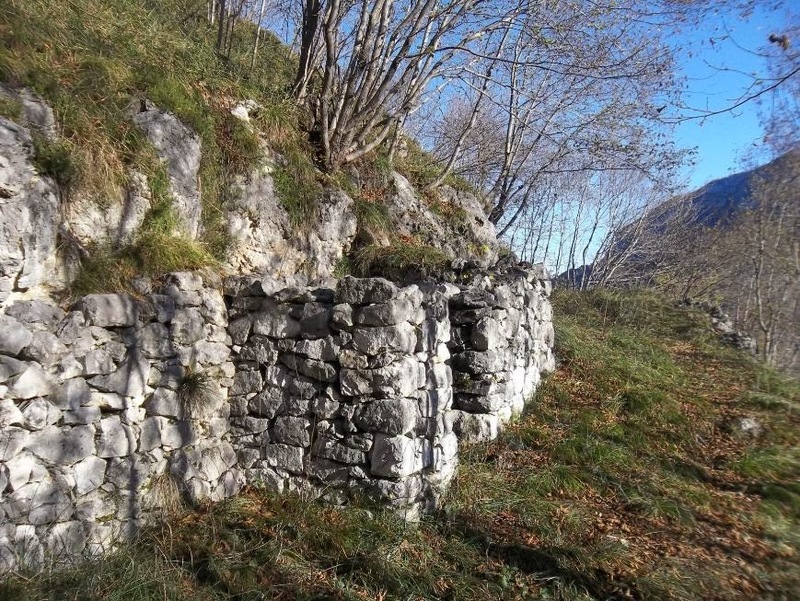 The Sentiero del Vu overlaps the path n.775, an old military track of the WWI which leads to Col d’Astiago (m.1240). It takes in total 5.30/6.00 hours and can therefore be undertaken only during the spring or the summer. Anyway a shorter version of the itinerary which does not reach the summit and follows an alternative way back is perfect also for the autumn and the winter time, that's to say for this period. We’d like today to suggest you this one because it presents no difficulties, it's short (in total about 3.30-4.00 hours) and fits each year season. It enables therefore almost everyone to discover the traces of the Great War in this valley. Starting point is the hamlet of Londa, in the village of Valstagna. Park near the cemetery, then walk along the main road with direction Valstagna only few minutes. In the center of the hamlet you will first see a slim white house on your right with a niche of the Virgin; few steps further on your left, you then see a red house of the XVIII century on the background and before, always on your left, the signpost of the path n.775, also called “Sentiero del Vu”. Follow it turning on the left, walk along the houses and, turning again on the left, cross the terraced fields, once used for the tobacco plantation (and admire the dry-stone walls, a masterpiece of engineering!). In about 15 minutes you will see the first trenches and mule tracks. There is also a 50 meters long gallery, which was used for the artillery fire. Looking from the 4 gun openings you will have a perfect view on the valley on north, toward the Grappa, on Valstagna and the Brenta river valley and finally on the south, toward the plain and Bassano. 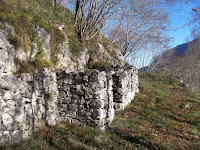 Follows the path and walk again about 5 minutes and you will cross the “Alta Via del Tabacco” (AVT). A white label gives you information about the “Tobacco Road” and your position. Turn then right and walk again on path n.775 till you reach a small hut, today almost ruined, and short after, on the right and signaled with a wooden sign, small trenches with observation points toward north, that we recommend to visit. Continuing then on the original path you will reach in short a fork: on the right the path n.775 continues with an equipped itinerary and reaches Col d’Astiago, on the top of the mountain, in about 3 hours. This could be fine if you are well trained and in an appropriate season, but since we’re talking today about a “winter itinerary”, we suggest you this time to turn right. Actually you will see also on this right side the indication of path n. 775 with direction Col d’Astiago in 3 hours, but follow instead the Tobacco Road – Alta via del Tabacco among the wood, till you find on your right an indication to the Contrada Postarnia (m. 448). You can walk down immediately, but we suggest you a small deviation: if you walk few steps ahead, you will find on your left a path climbing the slope: it’s an old mule track of the Great War, which leads you in 15 minutes to the Contrada Mandre (m. 786) (open only during the summer time), where you can seat and enjoy the landscape also on the Asiago plateau. Then turn back, walk down toContrada Postarnia and reach through a stony road - once again from the war time - the center of Valstagna, where you can finally find a place to eat something. If you have some more time, it is maybe worth to drive to Bassano and visit the Ponte degli Alpini and the local WWI Museum.